"The Naval Glories of England have never lacked artists and poets to celebrate and perpetuate them, and the most distinguished living representative of these nautical painters is Mr. W. H. Overend of London, - even better known in this country by his work in black and white than by his paintings. In this large canvas, his only contribution to the Exposition, he has given us a novel and striking subject, and cleverly overcome most of the difficulties of his very trying composition. 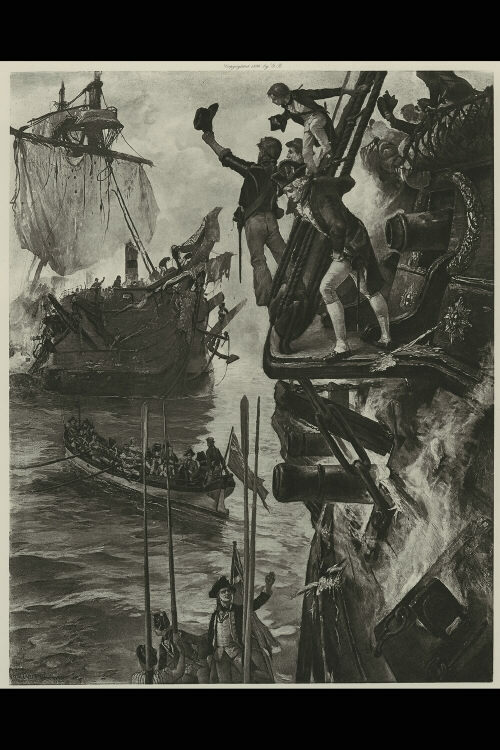 In the middle distance the great shattered hulk of the enemy - whose exact nationality is discreetly suppressed - looms up through the smoke, and from the battered and smoking colossus in the foreground, whose wooden wall occupies nearly half the view, the boats crowded with sailors, officers and marines are putting off to board. The artist's skill with his human figures is well shown in the management of the little group at the foot of the shrouds, over the last boat, - the brawny tar cheering, the little blonde 'middy' above him, and the picturesque young officer with powdered hair and white small-clothes".